Yuzu, a fruit which you may well have tasted but rarely seen, is a popular Asian citrus variety with a beguiling and exotic flavour – somewhere between a sweet mandarin and a fragrant grapefruit. Until recently I had only ever tasted it in Japanese restaurants, usually combined with savoury flavours – it is excellent with fish – or in salad dressings. I am now delighted to discover you can buy hand squeezed fresh yuzu from thewasabicompany.com, along with other more mainstream suppliers, like Waitrose. At this time of year, The Wasabi Company also sells the whole fruit, a small and deeply wrinkled orb shaped citrus indigenous to Japan and Korea, which is in season now. The zest is prized for its strong flavour and is often used instead of the juice. The benefit of the juice over the whole fruit is that a whole bottle can serve several recipes, is less expensive and keeps for longer. So for this recipe, I’ve substituted the yuzu zest with bergamot. Another exotic fruit, but one which is grown in Europe and therefore much more available and also in season this time of year. It has a slightly sweeter, more fragrant flavour than lemons, the zest is highly perfumed (traditionally used as the scenting oil in Earl Grey tea). 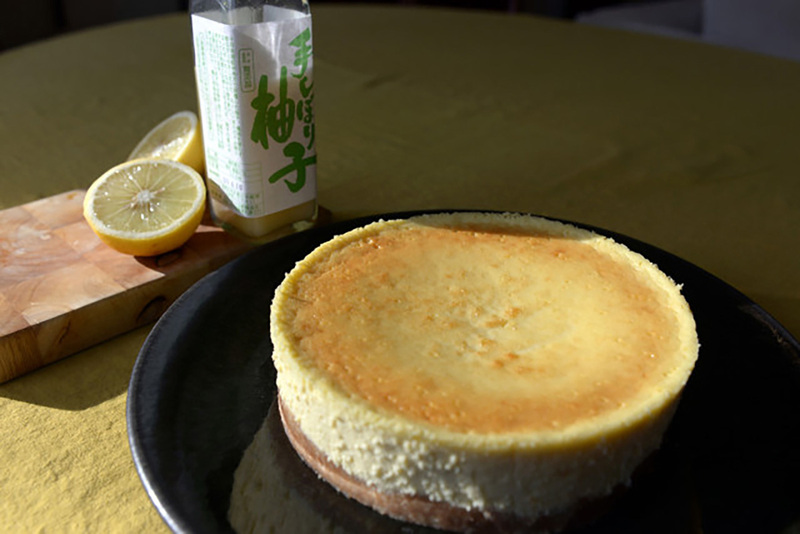 Bergamot zest adds a delightful flavour to the cheesecake mixture and the sweeter yuzu juice adds a good balance with both flavours contributing exotic and unusual elements. If you end up buying more than one bergamot and need other ideas of ways to use it, Patricia Michelson of La Fromagerie, one of a few retail stockists of bergamot, recommends making bergamot syrup to add to prosecco or sparkling water. She also likes to slip slices of bergamot into a cup of Earl Grey and single- estate Ceylon tea. Or recently I ate a beautiful pudding of poached quinces with whipped bergamot-infused cream at Sally Clarke’s restaurant, Clarkes. With Thanksgiving this week, I looked to America for pudding inspiration. A cheesecake is not a dessert I grew up with and one which took me some time to come to like, probably because I’d never had a really good one. Challenged by this, I thought I’d introduce these new flavours to something classic and try to give it a lift. I’m a fan or Mascarpone but it can create too heavy a filling, so I’ve used half yoghurt to balance it out. The yoghurt also gives a subtle sourness to temper the richness of the cream cheese. More importantly, it’s light, delicious and really simple to make – with an impressive outcome, if nothing else, that’s worth giving Thanks for. Using a pestle and mortar or a food processor, crush the biscuits until they are the texture of coarse crumbs, then mix with the melted butter. Line the base of the springform tin with baking paper and wrap the bottom of the tin with a single sheet of tin foil which covers and seals the base and sides. Repeat with another sheet for double protection. Press the biscuit and butter mixture into tin, using your hands or a spatula to form an even surface. Place the tin in the oven for 8-10 minutes to toast the biscuits and form a crisp crust. Remove from the oven and cool. Put the yoghurt, mascarpone and sugar in a large bowl or the bowl of an electric mixer and beat to combine. Add the eggs, yuzu juice and bergamot zest and continue beating until you have a smooth, creamy mixture. Place the tin in the roasting tray and pour the cheesecake mixture over the biscuit base in the tin. Boil the kettle and fill the roasting tray with water so that it comes at least halfway up the sides of the cake tin, but be careful it doesn’t seep over the top of the tin foil. 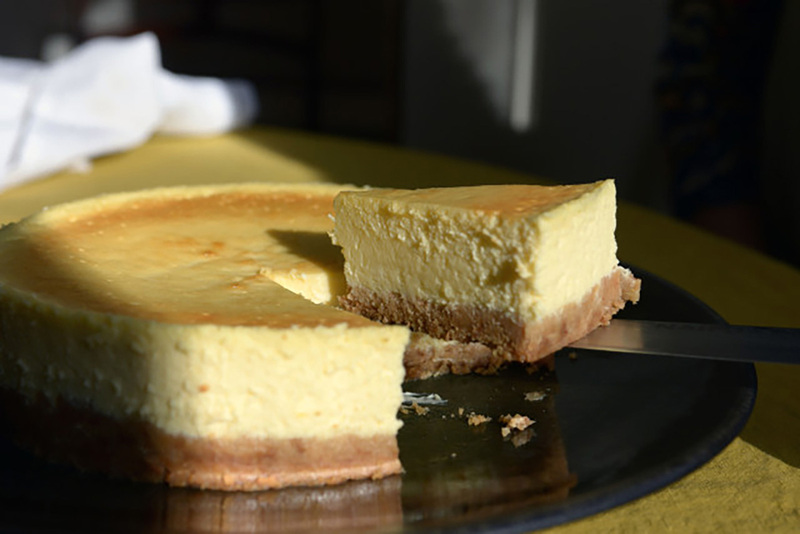 Carefully place the roasting tray in the oven and bake the cheesecake for 40 minutes then reduce the temperature to 150°C and continue cooking for another 10 minutes. Remove the cake when the top still feels slightly wobbly. Carefully lift the cake tin onto a wire rack and allow to cool before removing the foil. When the cheesecake is cooled to room temperature, chill in the fridge for an hour or so before removing the springform tin. The cake can be kept in the fridge for up to 2 days.